Each independent book retailer is uniquely independent. The American Booksellers Association is the common connection to the larger book industry. 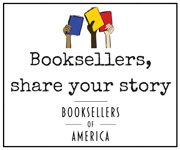 Backed by the strength of its membership, ABA gives voice to thousands of booksellers, influencing publishers and advocating for small businesses. ABA events and workshops bring members together, creating communities that learn, network, and form bonds. ABA member resources offer support and solutions for the day-to-day operations of today’s independent bookseller. Any business engaged in the retail sale of books can apply to be a bookstore member; there are also member categories for publishers, vendors, and friends of the industry. Benefit details and membership categories are below. "Having a strong resource like ABA has been a key factor in helping independent bookstores weather all the business challenges of the past 20 years, from chain stores to Amazon to ebooks to the recession." See descriptions of membership types at bottom of table.